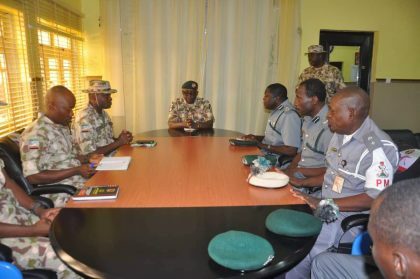 Texas Chukwu, Abuja: The Nigerian Army has promised to collaborate with the Nigeria Customs Service in restoring transnational trades around Nigerian borders. The Acting General Officer Commanding (GOC) 7 Division Brigadier General Abdulmalik Bulapledge duringhe pledge during a courtesy visit by the Comptroller of Customs Borno and Yobe Commands, Mr Abdulllahi Biu to Headquarters 7 Division Maiduguri. He expressed delight for the posting of the new Comptroller considering his vast experience and track record of commitment to national duty. According to him, “the challenge of terrorism is one no agency could confront alone, working together and collective partnership will ensure that the situation that has bedevilled the North East is resolved in the fastest possible means”. He further stated that, with the vast knowledge of the Comptroller and also being a great team player together they would tackle the Boko Haram menace. He also commended the cordial relationship and synergy between the Nigerian Army and Nigeria Customs Service, adding that interagency collaboration with other security agencies is already paying off and urged him to key into the collaboration. He highlighted high volume of transnational trade along Gamboru area, while acknowledging the challenge troops face when escorting vehicles on such difficult terrain and routes. Earlier in his remark, the Comptroller stated that he was at the Division to officially interact with the Acting GOC since his assumption of duty as the Customs Area Comptroller, Borno and Yobe Commands. He commended the efforts of the Nigerian Army in the fight against insurgency and in creating a peaceful atmosphere despite destruction of some trade routes around Gamboru for the people in North East to thrive in trading activities. He solicited the Army’s assistance in the provision of protection to make those transnational routes more secure for trade to thrive, providing employment to the teeming youths of the region and boosting Nigeria’s national revenue. He also affirmed his readiness to collaborate with the Army towards ending insurgency and would be available at any time he is called upon. He said the Nigeria Customs Service has the dual responsibility of securing national borders and facilitating trades. The Comptroller was accompanied during the visit by some senior officers of the Nigeria Customs Service. In a related development, the United Nations Mines Action Service (UNMAS) led by the Country Programme Coordinator, Julie Myon also visited the GOC where she solicited the support of the Army to enable the body carry out its duties in the region. In her remark, the Programme Coordinator said the agency is a UN specialist arm that specialize in mitigation of all explosive hazards such as mines, explosive remnants of war, cluster munitions and improvised explosive devices. Responding the GOC assured the agency of the Army readiness to support and collaborate with the UN agency. Present during the visit were some Principal Staff Officers of the Division.